piCture pOlish: Majesty by Sahrish Adeel - Review & Swatches | Sahrish Adeel - Malaysia based Pakistani Beauty & Lifestyle Blogger! Last year after celebrating piCture pOlish's Blog Fest - 2012, the girls at piCture pOlish contacted me to create a collaboration shade for their upcoming collections. To be honest, I was not expecting this at all and their email made me jump all over my house. =D This is such a huge honor for me to create something so beautiful with an international brand. Keep reading for more details and swatches. Majesty comes in a transparent glass bottle with a black handle that has a rubber grip. The bottle contains 11ml of product. 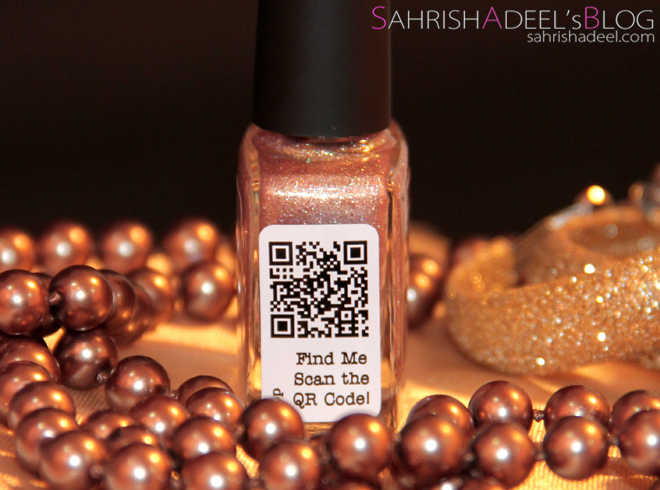 This shade has dull gold shimmer, which is really fine, with a very subtle pink & teal tone. It gives a shiny finish. Handle grip is really good. Brush applicator works really fine and gives precise application. This nail polish can be used as a single coat to have sheer coverage. Two heavy or three light coats give full coverage to the nails. It can be used as a top coat on any single color nail polish to create new shades. It reflects the color of the outfit you are wearing. The reflection is not much but it kind of goes with every outfit except for a silver one. It dries in a reasonable amount of time which for me is quick. Stays on my nails without chipping for 7-9 days (single coat) & for 5-7 days (two or three coats). (conditions; I do every possible household chore everyday and my hands have to deal with water all day long). It does not stain nails at all. I did not find anything negative about this nail polish. When I received Majesty, I literally applied it right away and I fell in love with it on first coat. I am a person who loves to wear nail polishes that don't need to be changed too often because I don't get enough time to get busy in the whole process of removing one and wearing other. I like a nail polish shade that has a quick drying time, that stays without chipping with all the washing and cleaning around the house & a shade that will look good for everyday routine or special occasions without looking too tacky and yet I liked thing different than the usual nudes, silvers & golds. If I talk about application, the brush gives really precise application and the first coats dries super quickly. By the time you are done painting your tenth nail, the first one ready for second coat. Drying time of second coat depends on the amount of nail polish applied. If I want full coverage with second coat and I apply a thick layer, it dries completely and becomes solid in give or take 2-3 minutes. But if I apply a regular second coat, it does not take so much time. The swatches have all thin coats and you can see the coverage in third coat. Staying time of this nail polish is also really nice. I have noticed that it stays on the nails the most when I apply a single coat. It literally sticks to the nails and you cannot feel the layer. The more coats you paint, the less staying time you gets and that is basically a rule in all nail polish applications where you don't seal the nail polish all the time. In everyday routine, I don't like to seal my nail polishes with clear top coats because for me that is just adding extra time to pamper myself and a mommy never gets time for that. I usually keep some glittery and shimmery nail polishes to use as a top coat on my single shaded nail polishes to add some extra fun to my manicures. Since I have got Majesty, I have been applying this on almost every single shades nail polish I have in my stash. I am really glad to see how beautifully it works with white, neutrals, neons, bright, dark and black shaded nail polishes. Overall, I am in love with my precious! Majesty is highly recommended from my side for makeup users of every age. I am not saying it just because it is related to me but it actually works great and if you will give it a try, you won't regret it. Do wear it single or pair it with your favorite single shaded nail polish and let me know what you think of it. Majesty will be available to purchase from 16th of January, 2013 on piCture pOlish's website & each bottle will come with the price tag of AU$ 11.50. They ship worldwide. You can also scan the QR code from your phone and it will take you directly to the website. If you are living in Pakistan, you can contact Enhanced Beauty on Facebook to get your own bottle. I am so thankful to piCture pOlish for giving me this opportunity and for the trust in my work. I literally don't have enough words to describe my feeling. Also, I have tried my best to take the best possible shots to show the real color but still it was not an easy shade to capture. But yeah, the swatches are more than 95% close to what it looks like in person. What do you think of Majesty? Do leave your feedback!